To evaluate the characteristics of images generated by magnetic resonance imaging (MRI) and changes in the mass-like lesion (MLL) during the follow-up of patients who underwent partial nephrectomy (PN) with the intra-operative use of hemostatic agents (HAs). 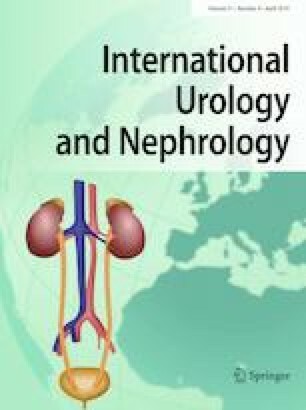 The records of patients who had undergone PN in our clinic due to renal mass between January 2013 and August 2018 were retrospectively reviewed. Our study included 47 patients who were administered one or more HAs during the PN and who received diffusion and dynamic MRI at the post-operative 2nd/4th Queryand 12th month. MLL is defined as T2 heterogeneous, intermediate-signal intensity bolster-related mass with a pseudocapsule in the renal parenchymal defect. When we looked at the morphological changes of MLL, the mean largest axial dimensions of masses were 27.3 (range 12.2–44.7) mm in the first follow-up period (2nd/4th months) and 21.2 (range 11–44.7) mm in the 12th month follow-up period. The average change in size of MLL was − 0.66 mm/month. We did not see any significant relationship between observation of MLL in the post-operative follow-up MRI images and the use of HAs such as Surgicel®, Spongostan®, and autologous fatty tissue as well as the amount of the agents used in PN operations (p = 0.405, p = 0.159, respectively). The distinction of MLL causing bolster-related mass and granulomatosis tissue from relapse/recurrence can be made based on the change in mass size observed in the MR images and image characteristics. There is no conflict of interest. Author Erdem KISA declares that he has no conflict of interest. Author Hilal Sahin declares that he has no conflict of interest. Author Ozgür CAKMAK declares that he has no conflict of interest. Author Cem YÜCEL declares that he has no conflict of interest. Author Gokhan KOC declares that he has no conflict of interest. Author Zafer KOZACIOGLU declares that he has no conflict of interest. Author Yusuf Ozlem ILBEY declares that he has no conflict of interest. All procedures performed in studies involving human participants were in accordance with the ethical standards of the institutional and/or national research committee and with the 1964 Helsinki declaration and its later amendments or comparable ethical standards. Local ethic committee; Date 13/02/2019 No: 24.